University of Vermont Extension provides timely, research-based information and education to help Vermonters acquire skills to make informed choices about food, to promote healthy living and to support economic and social wellbeing. UVM Extension works with individuals, families, and community partners to promote healthy living. Programs provide information and education to assist Vermonters in acquiring new skills and to make informed choices about their food. Expanded Food and Nutrition Education Program (EFNEP) Working with local partners, this state-wide program offers nutrition education programs for income-eligible adults and children. Resources & Recipes Looking for healthy recipies? Concerned about diabetes? Packing lunches for a preschooler? Shopping on a budget? UVM Extension encourages and supports healthy eating and living. USDA SuperTracker This personalized tool from the USDA helps you to plan, analyze, and track your diet and physical activity. Food security is defined as people having physical and economic access to sufficient, safe and nutritious food that meets their dietary needs and food preferences for an active and healthy life. These programs address how to increase this access. Senior Farm Share This program matches older adults living in subsidized housing with Community Supported Agriculture (CSA) farms, thereby increasing their access to fresh, local produce. Bringing Food to the Desert This 5-year project targets Vermont's Northeast Kingdom to explore ways to get more healthy, affordable and regionally produced food into independent markets in underserved communities. Vermont Farm to School Network These programs emphasize changing the food environment in schools so that youth have increased opportunities to select locally produced, healthy foods. Food Safety for Food Manufacturers and Processors Ensuring the safety of locally manufacturered and processed food products is critical to protecting Vermont's reputation and markets. Food Safety for Consumers A resurgence in home gardening and food production has led to renewed public interest in home food preservation. Using proper food handling and safety practices for these foods, as well as purchased foods, is essential to prevent food-borne illness. Everything you eat and drink matters. 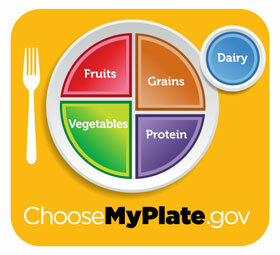 MyPlate is a reminder to find your healthy eating style and build it throughout your lifetime. From the USDA.